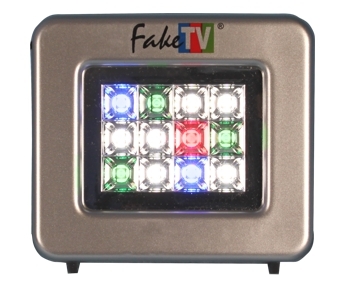 Much like the FTV-10, the FakeTV model FTV-11 makes light like a television does. It just makes more of it. That makes the effect more noticeable, especially when used in a location that includes a widescreen television. The FTV-11 simulates the light of a 40″ LCD television. 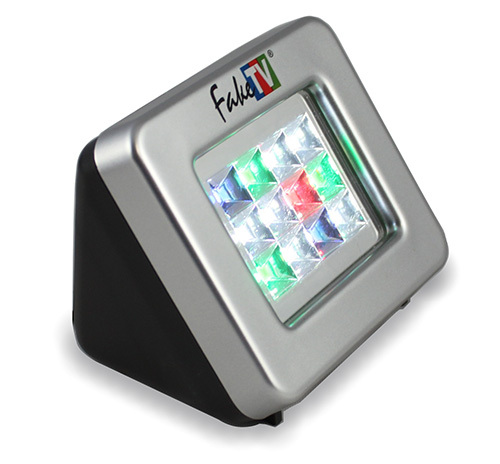 It is thus three times brighter than the FTV-10, making it a better choice for larger rooms. The FTV-11 does this with a well designed reflector that makes use of every ray coming from the LEDs, and produces an even illumination. 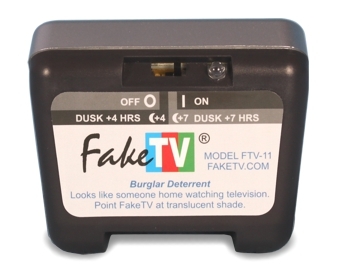 Fake TV is controlled with a single switch to select off, timed, or sensor/timer operation. Pretty much, yes. We have been making FakeTV for five years now, and almost the only thing people ask for is “brighter.” Our customers like the product and there just was not much else to improve upon. Rather than just add more LEDs consume more power, we fired up our computers and designed a really efficient reflector. We tested this for months, and all our beta sites really liked it. One more thing: we made the software so that the simulation is even more dynamic and colorful. In the years since we introduced FakeTV, television programming has gotten more colorful as producers have learned to exploit the full range of HDTV. We have also incorporated these software improvements into our FTV-10. We used it this week while we were out on vacation and we didn't have any burglars! We hooked it up the night before just to see if it was really going to work and it did! We were pleasantly surprised. It gives you just enough light where you think “Yeah, somebody must be home, not gonna take a chance there”. We're very pleased with both of our burglar deterrents. We WILL be telling our friends! I love this FakeTV. What a great idea. I will be ordering several for Christmas gifts. This tool will provide the illusion that someone is home. Hopefully the bad guy will try another place or easier target due to the fact someone “may” be home. This $30 tool can easily be set on timer when your not home. We promote this tool for community members who may be out of town or on vacation. Keep in mind that this is not a substitute for deadbolts, dogs, effective lighting, and other crime prevention methods but a great addition to those that like to be proactive and deter criminals. I was surprised and a little shocked at how small the FakeTV tv was, but it gives out so much light and is very realistic when I stand outside and look at the window. I love it, thank you. Sometimes an idea comes along that is so simple but amazing. You have a great product, I hope you do very well with it.